Baseball. Image via Pxhere. Claimed as public domain. Seventy-nine-year old Linda Goldbloom was killed by a foul ball at Dodger Stadium in late 2018. While her husband reached an undisclosed settlement with the team, he and Goldbloom’s family say the team can do more to improve safety. The family of a 79-year old woman killed by a foul ball during a Dodgers game is asking the Los Angeles-based team to improve safety at Dodger Stadium. Erwin’s wife, Linda Goldbloom, died after attending an August 25th game between the San Diego Padres and L.A. Dodgers. Struck by a high-flying foul ball, the woman was rushed to a hospital. She did four days later from traumatic head injuries caused by the impact. Her daughter, Jana Brody, told the New York Times the impact was like a bullet. 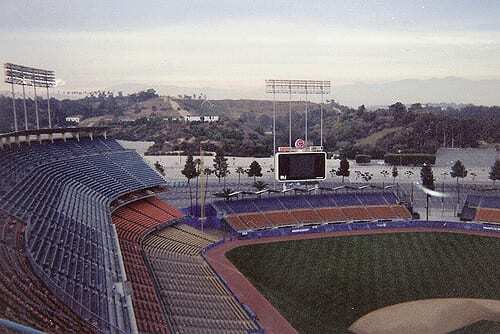 Dodger Stadium in Los Angeles, CA. Image via Flickr/user:kenlund. (CCA-BY-2.0). Brody told the Times she hadn’t been at the game with her parents. But as the months went by, she wondered why her mother’s death hadn’t been made the news. The Dodgers certainly hadn’t tried to publicize the incident, and nobody from the media seemed interested in doing the same. She told the Times that she spent a while pouring over records, finding only one other story of a fan being killed by a stray ball at Dodger Stadium. Erwin Goldbloom’s said the same. “If they would’ve raised the vertical net, I think the ball would not have hit us,” Goldbloom told ABC, recounting the moments after his wife was struck. With MLB fans sitting closer than ever to home base, Brody says the league should raise its netting high enough that line drives fall short of the crowds. Goldbloom, notes the Washington Post, settled a wrongful death suit with the Dodgers. The terms prohibit him from discussing the award, or whether he was allotted any form of financial damages.